Today we’re looking at the best cockatiel cage and cockatiel toys for your pet birds. Cockatiels are easy to look after, making them the second most popular bird cage pet. They’re also very friendly and like to interact with humans a lot. Native to Australia and from the cockatoo family, they’re a medium sized pet bird that require small to medium sized cages. For each cage we looked at the build quality, design, price and ease of use. 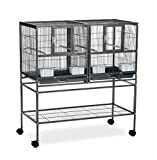 Cockatiels cages are priced mid-range when compared to other bird cages. Included in the list below are recommendations for cheap cockatiel cages, the cage setup steps you need to follow, recommended accessories and how to use a stand with your cage. 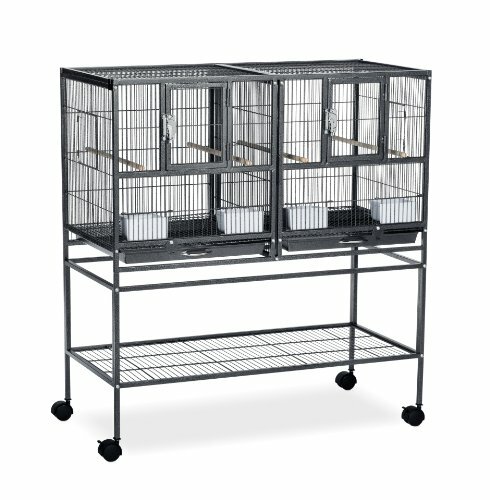 So start off by checking out the table below for the best cockatiel cages to match your needs. How big should a cockatiel cage be? As a general rule of thumb, the bigger the bird cage, the better it is for your bird – and this holds true for cockatiels. A cockatiel is a medium sized pet bird. At a minimum, a medium sized pet bird needs a cage that has dimensions which are at least the following: Width 25″, Depth 32″, Height 35″. However, if you decide to have a cockatiel cage for two or more birds then you need to multiply the volume by x1.5 to x2 times the amount. So two medium sized cockatiels would need a cage that is width 30″ x depth 35″ x height 40″. Don’t forget to also calculate space for any bird cage accessories you want to include inside the cage. Also, keep in mind that birds like to fly sideways so width is often a better choice over height. You also need to think about the correct sized bar or wire spacing. 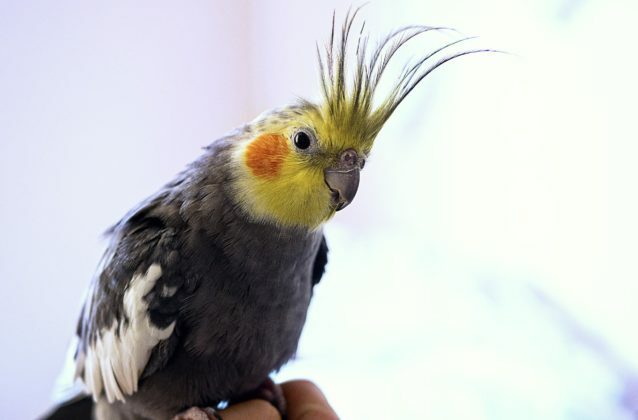 For cockatiels, we recommend that at a maximum the bar spacing is no bigger than 5/8″ to 3/4″. Also, that the wire diameter is at a minimum 2.5mm thick. Most cockatiel cages come with stands but not always, you can check if this is the case if it’s one of your requirements. If you’re looking for something smaller in size then aside from the usual cages there are hanging cockatiel cages (which also require a hanging bird cage stand) and cockatiel travel cages – which are ideal if you’re going to the vet. 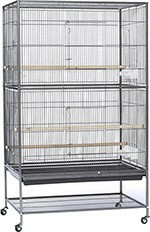 If you’re looking for cockatiel cage set up for two or more birds then you might need a large cockatiel cage such as a flight cage. Or perhaps if you’re thinking about mating the birds then you need to consider a cockatiel breeding cage which will stop any cockatiel from laying eggs on the bottom of the cage. Don’t just think about how much your bird cage is going to cost when budgeting for your bird. Consider how many accessories and other items you’re going to buy as well. 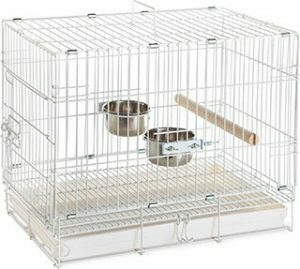 Leaving travel cages aside, cheap cockatiel cages can be found for as little as $90 but normally the price range is $120 or more. A premium cage starts at $200 and is worth it if you have the money and really want to treat your birds. If you choose a cockatiel aviary then the costs can be considerably more. Maintaining a cockatiel cage can be chore if the cage isn’t designed properly. You need to consider how easy and accessible it is to open the cage doors and whether or not they open in both directions. Also, what is the size of the doors to ensure your bird will fit. You’re going to be topping up the food and water fairly frequently so think about how easy it is for these to be accessed. Last but not least, is the floor removable? A removable floor will make cleaning your cockatiel cage much easier (you can see our guide to cleaning bird cages here). Some cockatiels are chewers and they’ll start biting into your cage wiring. If you’ve got a cage that is made of the wrong materials then this can be toxic for your birds. 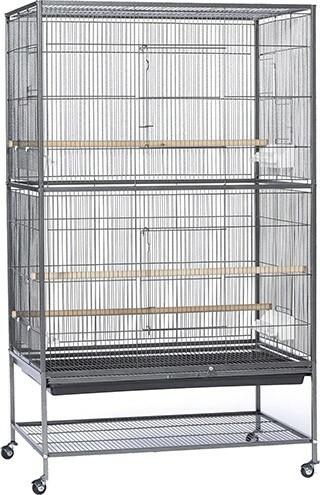 A good quality cockatiel cage will be made from wrought iron, stainless steel, aluminium or galvanized steel after welding. Toxic metals include zinc, lead and potentially galvanized steel before welding. According to A Parrot For Keeps stainless steel is one of the best types of cage though it often isn’t used because it is so expensive. Each cockatiel cage is set up to have enough space for a number of key components. You’ll need enough room for feeding and watering stations, perches, removeable trays, doors and even room for any toys you want to give your birds. PetHelpful.com recommends using a variety of perches of different sizes so that it the bird’s feet can be stretched and exercised on a number of different sized shapes – thus preventing foot problems. Where to place your cockatiel cage? According to CockatielRescue.org, cockatiel cages should be kept near windows so they have access to sunlight, away from kitchens to avoid cooking fumes, near areas where you can easily interact with your birds and in areas of the house that have stable temperatures so your birds do not get too hot or cold. 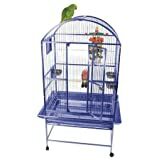 Considering how many items and features are included in this bird cage, it is very reasonably priced. The addition of the playstand will give your cockatiel somewhere to hang out and play when you take it out of it’s cage. Furnished with everything a cockatiel owner could need: feeding bowls, perches, cleaning trays, castor wheels, seed guard etc. Cleaning maintenance is simple with the removable tray design. 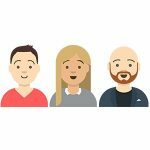 Some reports of minor customer service issues. This bird cage is a bestseller worldwide thanks to it’s numerous features, build quality and affordable price. What’s more, the colors and sizes for this model are customisable so it can easily be adapted to suit your needs. Lightweight so it is easy to carry. Collapsible which makes the cage very easy to store away when not in use. Has most of the features of a larger cage except on a smaller scale. Can be used with other small animals as well. Shouldn’t be used to house cockatiels for the long term. Ideal for transporting your cockatiel to and from the vet or when you’re moving house. We recommend you get one for emergency/back up cage purposes. Thanks to the extra space, cockatiels can do a small amount of flight and so exercise more. Plenty of doors and access points for cleaning and getting into the cage. The bottom shelf is a good storage area for any cockatiel accessories that you might have. Sturdy and made from good quality materials. No lock on the wheels. Because it is large, 2 people might be needed in the setup. Whilst lacking the extra features of the Prevue 3151, this cage makes up for it with it’s extra space. Another highly recommended cage. Designed so that if you buy additional units, they can go on top of one another. Perfect for anyone that is into the hobby of pet bird breeding. If you remove the central divider then the cage can be used as one large cage for your birds instead of 2 smaller ones. Plenty of storage room beneath the cage for any extra cockatiel accessories that you might have. Some minor, fixable problems have been found with the spring doors and central dividers for a small number of users. 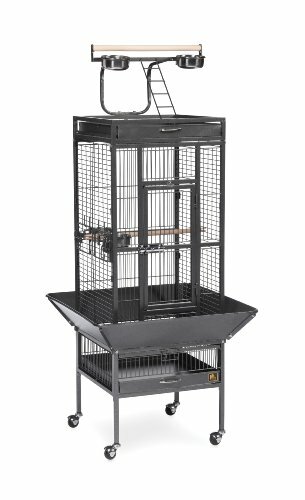 If you’re looking to breed two cockatiel birds then this is the cage to go with. A and E have a reputation for producing some of the best bird cages and it shines through with this model. Choice of a number of different finishes and colors. Fully furnished with triple feeding/watering trays, perches, seed guard, access doors etc. Large access door makes it very easy to access everything inside of the cage. More expensive but you get what you pay for with the high quality craftsmanship. Setup instructions are not entirely clear. Choose this cage if you want something that is spacious, sturdy and built to a higher standard than normal cages. 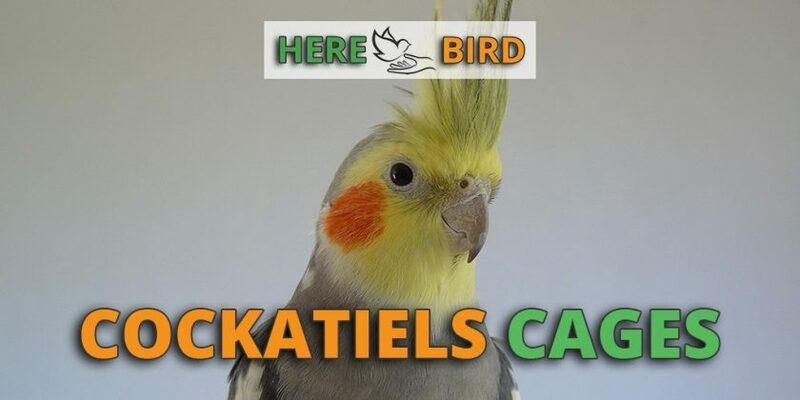 Your cockatiels will be very happy with this purchase. Once you’ve bought your cockatiel cage, next you’ll need to think about how to set it up, where to place it and what to include inside of the cage. For example, the temperate that we recommend you keep your cockatiels around is 20 to 26 degrees celsius or (68 to 78.8 fahrenheit). 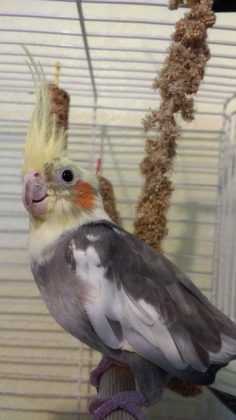 Maybe you’re thinking about saving some money and are want to buy a used cockatiel cage. You might discover there’s a few problems with this approach. You’ll need to first carefully inspect the cage for any potential damage that it may not be obvious upon first glance. It may be difficult to identify the model of a used cockatiel cage and without knowing what the cage is made of, you could be potentially harming your cockatiel with toxic materials. The wiring, metals and plastics of the cage could possibly be harmful. What’s more, there’ll be no guarantee or warranty if the product is defective. That’s why we recommend buying new cockatiel cage – but if you insist on buying secondhand then a good place to start is Craiglist, Ebay and Gumtree. Our full guide to buying a used bird cage can be seen here. In addition to the cage, you may want to think about some of the following cockatiel accessories. Every cage should come with at least one or two toys – their addition will be greatly appreciated by your birds. Because cockatiels have such active minds they need something to play with and chew on. For example, the shreddable bird toy shown in the picture can be found here. Whereas if you’re looking to make your own cockatiel toy then you can read our guide here. According to Cockatiel Cottage, a cockatiels diet should be made up with one part of common fruits and vegetables. Another part of this diet should also contain specially mixed together cockatiel seed bags that are made up of foods rich in Omega-3’s. If you’re looking for the fruit bag mix in the example then click here. Aside from fruits, vegetables and seed bags, alternative types of food include cuttlebone fish and pellets. 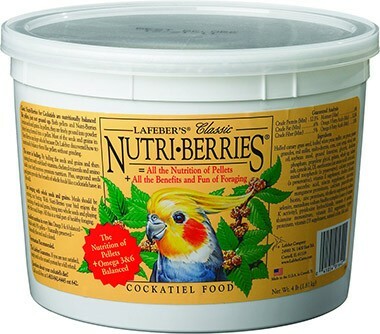 For a full guide to the best parrot food, check out our guide here. What type of cockatiel cage are you interested in? 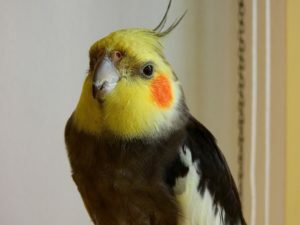 Before buying a cockatiel cage, you need to consider a number of different factors. You need the correct type of cage (such as a flight, travel or breeding), that is within your budget, is easy to use, and is the correct sized cage (small, large, double), from the correct materials (wrought iron, aluminum, stainless steel). 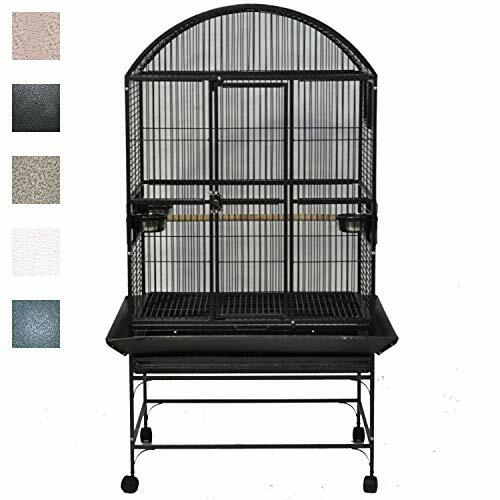 We looked at all of these options and overall concluded that the Bird Cage with Play Top (3151) was the best choice. If you’re looking to buy a cockatiel then check out our guides to cockatiel prices here. Want more information on cockatiel species variations? Then check our guide to Lutino Cockatiels. Want something larger? Then consider a cockatiel aviary and check out our construction guide available here. What are your thoughts? Let us know your opinions using the comment form below.